Font Scraper is a Windows utility for converting a font into a PNG bitmap file. It also produces an array of rectangles which define the position and size of the glyphs within the bitmap. It was written to assist developers with the difficult task of displaying text within an OpenGL application. The PNG bitmap can be used as a basis for a texture, and the rectangle definitions can be pasted into a statically-allocated array within the application’s source code. The ASCII code of the character can be used as an offset into this array to find the position and dimensions of the character in the bitmap. 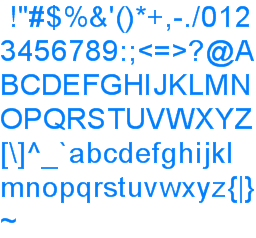 Produces a PNG containing a user-specified range of glyphs from the font, drawn over a transparent background. Also produces a text file containing rectangle definitions in a choice of six different formats, with or without comments, for pasting into your code. You can choose any font installed on your system at any point size. You can choose the colour of the glyphs. You can choose whether the font is anti-aliased or not. The height of the bitmap depends on the font and the bitmap width you specified. You can optionally round the height up to the nearest power of two. Font Scraper requires Microsoft Windows XP, Windows 2003 Server, Windows Vista or Windows 7. The font to scrape must be installed on your system. Below is an example of a PNG file generated by Font Scraper and an extract of the text file defining the rectangles (ready to be pasted into a static array of CGRect in the case of the iPhone). Please post any questions or feedback as a comment on this page. Font Scraper consists of a single executable file. Simply download the zip file and extract the program to your desired location. Font Scraper is free to download and use, but if you find it useful then donations are appreciated!